Organizations who sell products that contain many options often rely on Excel spreadsheets that have been passed down and are difficult to maintain. 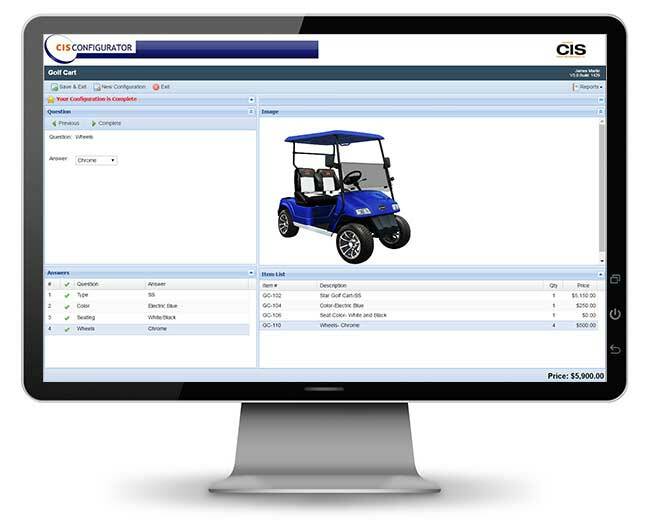 CIS Configurator allows you to use the logic that has been embedded in the application and displays relevant questions and/or answers based on valid options as well as creating a BOM on the fly. Sales Personal or users of the Configurator simply answer questions, with the answers resolving to items and pricing. Custom products can be accurately configured and quoted, quickly and easily without any costly mistakes. There are many features available in the Configurator that can be used to match how you sell your products. Examples include graphics being displayed based on an answer or many answers selected, made from transparencies or static images. Pricing and/or a currency can be displayed based on a Customer selected, with different options allowing you to display items, quantity and pricing. Some of our existing customers have many different pricing methods, including multiple Tiered levels and bracket pricing and Volume discounts. Our Configurator is powerful, easy to use and has too many features to mention. With years of experience we recognize that not all requirements may exist out of the box and we are happy to discuss your specific requirements. We recommend setting up a one on one presentation to see how CIS Configurator can help solve your quoting problems, you won’t be disappointed.